Unless you’re willing to go through the pain of laser tattoo removal, which is crazy expensive, tattoos are permanent. And even after several treatments, some tattoos only partially fade away. Moreover, leaving behind a permanently raised scar and a shadow image of your tattoo. So if you ever decide on getting yourself inked, you need to be a hundred percent sure that you’re absolutely and utterly in love with the design. Nonetheless, to prevent yourself from walking around with a mistake for the rest of your life, it’s extremely important to double check the spelling and grammar of the phrase you’re deciding to brand your skin with. The occasional slip up can happen to anybody. Even celebrities like Emma Watson. Emma recently appeared at the Oscar’s Vanity Fair Party – debuting a brand new tattoo on her right arm. It’s quite evident through her tattoo that she’s supporting an important cause; the “Time’s Up” campaign. However, if you look closely – you can see that an apostrophe is missing from her tattoo. And people on Twitter were more than eager to point it out. 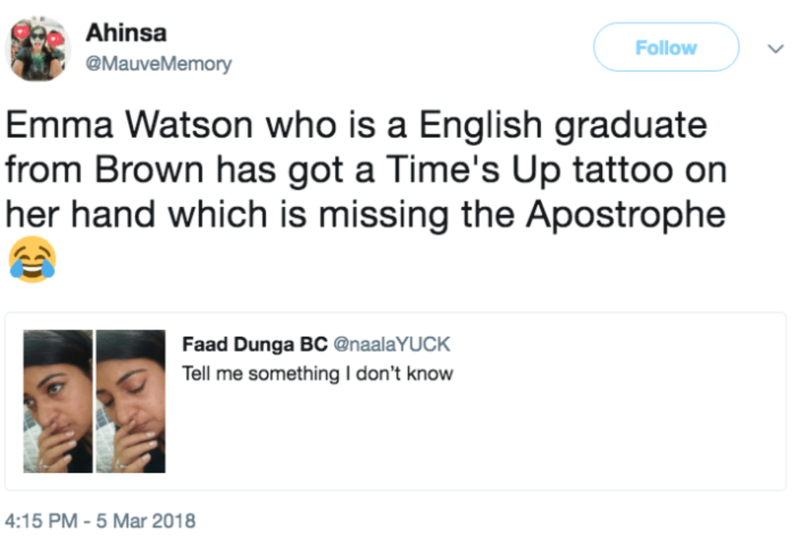 i cannot sleep at night knowing that emma watson's "time's up" tattoo lacks the apostrophe between e and s.
Love Emma Watson trying too hard to prove how much of a feminist she is with that Times Up tattoo and missing the apostrophe ?? Well however bad your day’s been.. you could always be Emma Watson(’)s tattoo artist! It, however, turns out, the tattoo wasn’t real. And Watson had the greatest response after all that backlash. Some even started sending in their resumes. I'm an English language student who's very picky with grammar. I have two tattoos, and although I have limited experience, I'm your girl? What about the Oxford comma?